Summary: Kitchen Electric Wall Oven Installation with a typical 240 Volt electric circuit with 3-wire and 4-wire configurations. Most older homes had 240 volt kitchen oven circuits wired with a 3-wire cable consisting of 2-hot wires and a ground wire. Fortunately most electric ovens can be wired to work with either a 3-wire or 4-wire circuit. All new installations require a 4-wire 240 volt circuit circuit which has a separate insulated neutral wire and the separate ground wire along with the 2-hot wires of the appropriate wire size depending on the oven that is being installed. 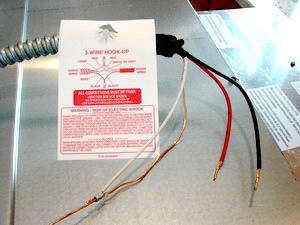 In some cases where the home is older than the new electric oven here's what you would have to do: Where the wires are connected to the electric oven you will need to install the Bonding Crimp Sleeve to Bond the Grounded Wire and the Neutral Wire as shown in the 3-WIRE HOOK UP wiring diagram below. The Grounded Wire is attached to the metal frame of the electric oven internally and is usually located inside the oven junction box enclosure. The following steps apply ONLY if the oven specifically states that it can be wired for either 3-Wire OR 4-Wire Connections. Some new ovens may require a Separate Insulated Neutral Wire AND a Separate Ground Wire for a 4-Wire Connection Only. The oven shown here can be wired for a 3-wire connection or a 4-wire connection as described in the attached wiring specifications. specifications for the configuration that is allowed. to an older electric oven with 3-wires. The white or neutral wire of the circuit is capped off and not used. Can a Oven Circuit be Used for a Water Heater? Glen asks: I have a 220 volt circuit coming in to my oven, can I use that line to provide power for a water heater? No, you cannot do this. Each of these devices needs to have their own dedicated circuit of power, and they both have their own specified amount of power. The water heater requires a dedicated 30 amp 240 volt circuit. Placing the water heater on the same circuit as the oven will overload the oven circuit and cause it to trip the circuit breaker off. What are the Wiring Connections for a 240 Volt Oven? Daniel asks: I have a 1980's Home, with a 3-wire 240 volt circuit which is Aluminum. I would like to know how to connect his cable to my new stove. 1-black insulation, 1-black with 2 red lines insulation and a bare ground. Does the black wire with red lines go to red on stove? Does it matter if the 2 hot are switched? Circuit Black wire to Black wire of the Oven. Circuit Black with Red to Red wire of the Oven. Circuit Ground, Green or Bare wire with Oven Green or Bare. 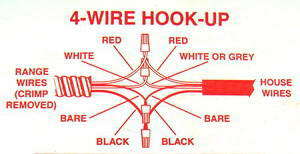 * It does not matter if the Black and Red wires are reversed with 240 volt oven wiring. * Some 4-wire ovens do permit bonding the White Neutral wire to the Ground wire. Check the Electrical Connections in your installation manual to be sure. 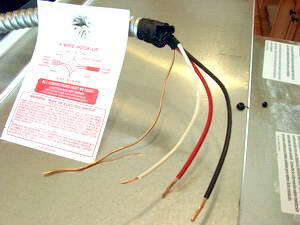 How to Wire a 240 Volt Oven Circuit: Kitchen Oven Electrical Wiring and Circuit Requirements. How Do I Connect The Wiring For a New Oven? 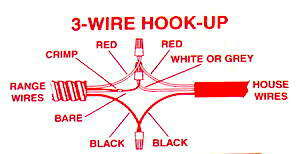 How to Wire a New Oven When Replacing an Existing Oven: What to do when you have black wire, red wire, white wire, and a ground wire. How to Identify the Oven Wires when Replacing an Oven: Connecting the Electric Wires for an Oven. Is it OK to install a new 4-wire oven, with black, red, white and green wires? I just removed a wall oven in a house built in 1994. I discovered that the supply to the junction box for the oven (on its own separate circuit) is Type SE 8AWG aluminum, with two black wires and the neutral being the twisted-strand insulated type. It is my understanding that NEC allows me to install a new 4-wire oven, with black oven wire to black, red oven to black, and white/green oven to insulated. Also, that I should coat the connections with an anti-oxidizing compound and use special purple wire nuts. Is this correct? Greg, This depends on the oven that you have. Some ovens require a separate insulated neutral wires and a ground. Consult the installation manual that came with the oven for specific details. Anti-corrosion compound is required when splicing aluminum and copper wires together, and the wire connector must be UL Rated for AL/CU wires. What are the proper wire connectors that should be used when hard wiring a double wall oven? This is a new kitchen renovation and I am replacing old aluminum wiring with 6 AWG copper 4-wire on 50 amp 240 volt breaker. Should I be using a block splice with shrink tubing? A copper split bolt seems bulky? Even the largest wire nuts seem inappropriate. Is a 4″ box large enough, those wires are not very flexible. I will be doing the same type of hook-up for an induction cooktop. The large blue connectors are typically used to make the connections for the oven wires to the oven circuit wires. Be sure to trim the insulation back and join the wires together side by side and then apply the wire connector by twisting in the clockwise direction. Install a junction box that has the required cubic inches for the total number of wires that will be enclosed inside the box. Which cable should I use for an oven circuit? What number Romex wire do I use to install an oven? What is the correct amperage? What is the required Romex wire? Joe, the circuit size is determined by the specific oven that will be installed. All ovens are not the same, such as double ovens, self cleaning ovens, and ovens located in other countries where the voltage is a factor as well. Therefore, it is best to obtain the electrical circuit information and specifications which are are found on the equipment nameplate attached to the oven, or in the installation manual or instruction which is supplied with the new oven.